Towards the end of last year I had a guy come to the counter and ask if I could recommend an album as good as the Twilight Sad album I’d sold him a couple of years ago. It turned out he was from the States, just south of Washington DC, and had had his own record shop which was now closed. They had been big in supporting the “DC scene” but …………… you can guess how it goes. Anyway his final point was telling and he wasn’t somebody who reads my blog. “Because you sold me that Twilight Sad CD two of my friends also bought it” he said. “And because you sold me that Twilight Sad CD myself and three friends bought tickets for their gig in DC. Some bands get that he said but most don’t”. He bought half a dozen CDs I recommended and a stack of other stuff and wished me luck. Just before Christmas two young lads came in and were chatting away asking about the new Godspeed album I was playing. “Last time I was in your shop I bought the album you were playing said one of the lads. In fact that is why we are here”. I didn’t catch on immediately but they were up for Christmas Baubles and of course the album I’d been playing was the Kid Canaveral album. We both love them he said. Seen them three times back home in Yorkshire (they were from Huddersfield). Bought everything they’ve done even the t-shirt ! Now there are dozens of stories like this involving There Will Be Fireworks or Withered Hand or Star Wheel Press or ………….. There was the girl from Lausanne who couldn’t believe Meursault were coming to town or the girls who flew from Germany especially to see the Last Battle in Aviemore after buying the CD in Avalanche. I”ve also had dozens of emails or customers commenting in the shop saying they only know of a band or label because of the shop and they will always buy from the shop whatever incentives they are given to do otherwise. It is very good of people to say this but buying music shouldn’t involve having to take sides. Also I’m very uneasy about customers paying more for a release and missing out on “extras”. Once the HMV/FOPP situation is clear Avalanche will definitely be “moving on” and I’ve had several very successful meetings recently so much is already in place. I’m told all must be resolved before HMV’s rents are due end of March so hopefully by Record Store Day in April I’ll have a firm idea of the way Avalanche will be moving forward. I have about three businesses worth of ideas and opportunities to consider so what I need to do is focus on those that pay the rent and I most enjoy. I hope people appreciate there is an integrity to Avalanche that forms the basis of what the shop, website, blog and twitter comments are all about. Monetising that is not easy but hopefully others have seen a value in Avalanche’s outlook and attitude. I’m in a similar boat! If it wasn’t for avalanche i would never have bought the Sophtware Slump by Grandaddy which is my favourite album of all time! Since then i’ve bought a load more G’daddy albums (inc. Jason Lytle’s solo stuff) from avalanche and last year i got that chance to see them in Glasgow which was just an amazing experience. 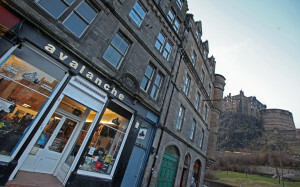 Avalanche has turned me onto to so many great artists which i feel i otherwise would never have listened to otherwise so i always look forward to a trip to the Grassmarket! I wouldn’t have purchased the amazing album by FLUTES, had it not been for spotting it on Avalanche’s website. Your point is totally valid – and considering your comments about “moving on” I wish you the very best of luck with Avalanche and hope that it continues to grow from strength to strength. Turn this into what makes you different. What about some big chalk boards with your top 10, customers top 10s, Scottish top 10s, that sort of thing. Makes the most of your extensive knowledge and might speed up the recommendation process. You could match this to new ways or sectioning the CDs and records too. If you refresh the categories you put, say the vinyl into, it will force customers to look at the sections a bit more different rather have them just go to one section they are used to and missing all the other great stuff you have in there (like the panda bear / actress 7). You’re the Scottish indie champion – no one else does that. Build on it. Make people come for that reason. And find more great indie music once they’re in. Kevin, a good indie record shop such as Avalanche is a social experience that goes beyond the mere transaction of buying the LP. It’s the banter, the informed recommendations, the flicking through racks of vinyl, brushing shoulders with similar enthusiasts, etc. I just wish I could get down from Crieff more often but thankfully the online shop is back in action. More new vinyl releases please.